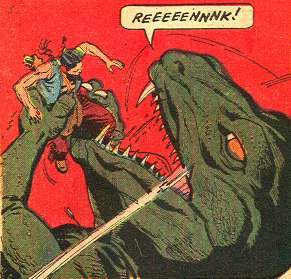 So it was probably about time to add a “Turok” category to my site. So after my post on Friday, I was going through a bunch of boxes at home and found my stash of planned eBay fodder that predated opening my store. In that box was my personal collection of the Valiant Comics Turok run, up through about issue 30. I think that was about the time I’d stopped reading Valiant Comics anyway, after losing interest in what had been an entertaining/exciting line of shared universe books, but that’s probably a subject for another post. But I still have my very own copy of the embossed foil chromium-carded cover, which I’m oddly pleased by. That sounds likely. I mean, it’s possible it was originally solicited one way but released as we know it if it turned out the full chromium cover wasn’t feasible. But, if that happened, that would have been a pretty big deal, I’d imagine, and a sizeable egg in Valiant’s face that would have been noted somewhere in something more Google-able than anything I’m finding now. Well, that particular copy in the shape that it’s in, I have priced at $2.25. I think it guides for…$4, maybe? Now at the previous place of employment, we had…more than plenty, shall we say, so we thought nothing of dumping ’em in the old bargain bin. Okay, maybe not “nothing” — I’m sure we sighed a little as we tossed in there alongside Wolfpack s and Semper Fi s — but their familiarity in the storage room bred some contempt out in the front of the shop, so away they went, hoping someone would take pity on us and haul them away a copy at a time. At my shop, I think I have just that one copy currently in stock. And I’ve sold a few since opening, none of which were out of the bargain bin. Twenty-something years on, it may not necessarily be as widely available as it once was. Stores that were around then that are still around now are few and far between, and stocks from old now-closed shops may be languishing in garages or storage units or landfills somewhere, effectively off the market. I mean, this is just me throwing a wild guess out there — you know where to debate me — but barring warehouse finds (or an E.T. 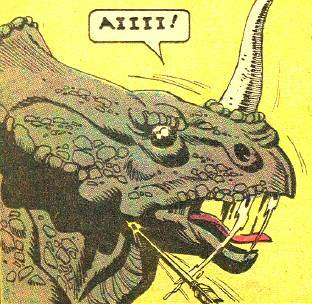 Atari game-style archeological dig) newer stores, like mine, probably won’t have Turok #1s in depth. And like I said in that post on my store site, fancy covers are getting rediscovered by newer generations who weren’t made sick of them back in the ’90s, so there is a market slowly building for them again! There’s also the “SHAZAM! 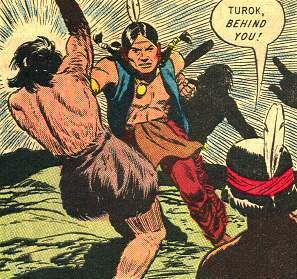 Effect,” as described here in yet another post where I talk about Turok #1, where copies are dumped in bargain bins and generally mistreated for decades when suddenly, whoops, near mint copies are suddenly hard to find now. Okay, 1.7 million copies are quite a few to work through, but there may be a point, someday, where nice copies of this comic are the exception, not the norm. We may all be giant-headed cyborgs with spindly bodies in floating chairs by then, but, you know, it’s theoretically possible. 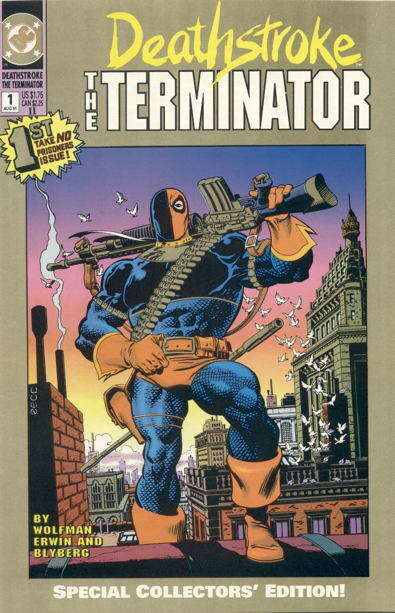 One other thing that can contribute to the attrition of nice copies of this comic (or any popular, way overprinted comic of the ’90s) came up in a Twitter chat I was having with pal Brandon. He was asking about the black-bagged Superman #75, and I noted that while there were a lot of copies sold of this, it seems like a lot of the copies I’ve seen come through the shop over the years were not kept in any kind of decent condition. This happens a lot: I direct you to this (gasp) 10-year-old post about an attempted investment collection where said investor did nothing to protect this investment. A lot of the people who bought comics in the ’90s are not buying comics now, and their collections have largely been discarded, shoved away in the garage, or otherwise no longer being stored properly since their owners have lost interest. A good portion of collections I see from this era are just straight-up unsellable. 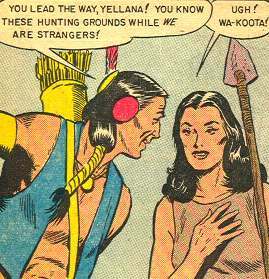 You’d think with all the bags and boards and top-loaders and high-end fancy-pants protectors we sold throughout the decade, more comics would have survived the trip. 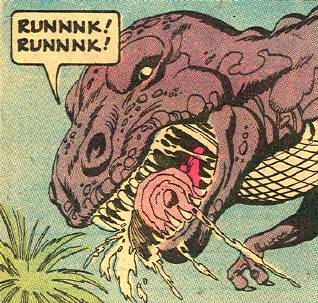 Just to be clear: I don’t think near mint copies of Turok Dinosaur Hunter #1 are rare in the slightest. But they may not be as easy to find as they once were. As for Deathmate …man, I may have to gather my thoughts on that turkey for future discussion, but I think it’s cute how hard folks tried to make Deathmate: Black a hot comic because Gen13 made an early appearance in it. Frankly, I think even typing the word “Deathmate” made all comics in my immediate area lose 20% of their value. 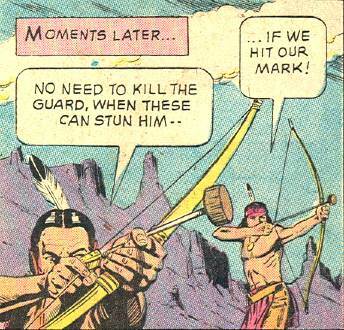 Turok creates the prototype for Green Arrow’s boxing glove arrows. 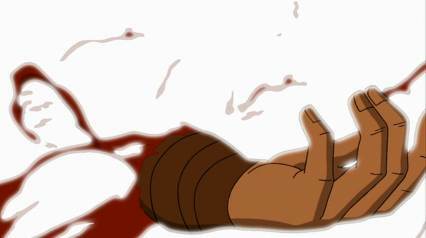 § May 11th, 2009 § Filed under turok Comments Off on Turok creates the prototype for Green Arrow’s boxing glove arrows. 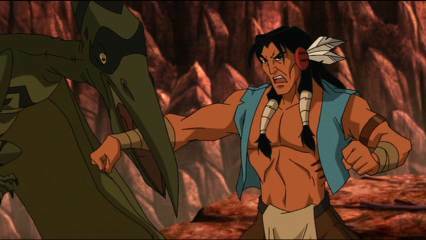 Turok: Son of Stone trailer. 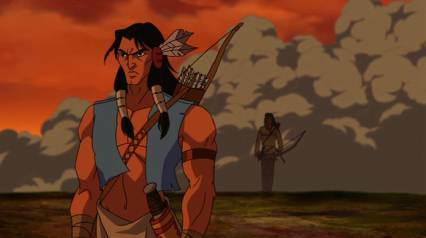 § December 27th, 2007 § Filed under turok Comments Off on Turok: Son of Stone trailer. This just kinda snuck up on me…I wasn’t aware this was even happening, but apparently it’s a real project. Huh. 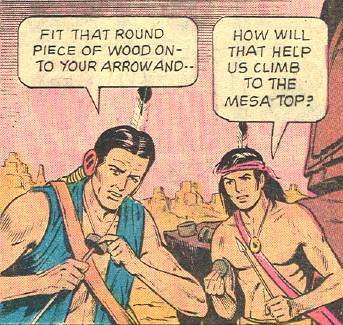 I don’t mind iff there’s no Futuristic weapons or that, but The only thing I’d comment on is that when the guy says ‘I am Turok’ It doesn’t sound the best. 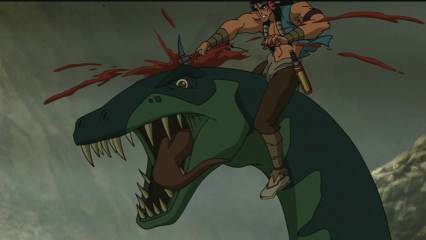 Three reasons Turok, Son of Stone, is cool. 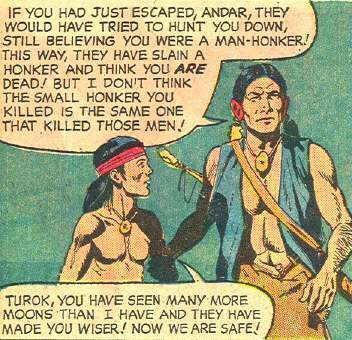 § May 3rd, 2007 § Filed under turok Comments Off on Three reasons Turok, Son of Stone, is cool. 1. HAS A WAY WITH THE LADIES. 3. 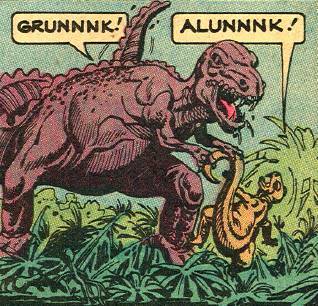 FOUGHT FREAKIN’ DINOSAURS, MAN. 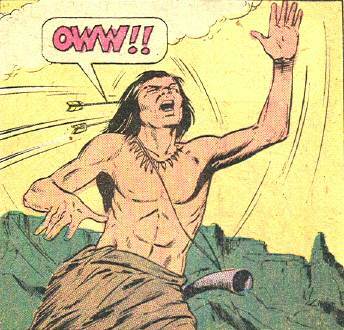 § September 13th, 2005 § Filed under market crash, turok Comments Off on More crash talk. 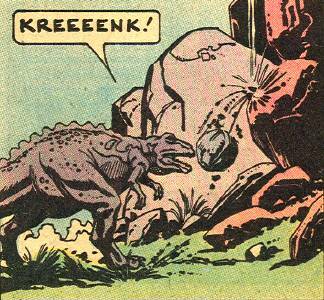 So my insanely rambling post yesterday regarding the comic market crash, a couple commenters noted that Superman #75, the infamous “Death of Superman” issue, and Turok #1, the infamous “didn’t sell like we were all expecting it to” issue, may have come out on the same day. That is very possible…I don’t have my invoices handy to confirm, but it wouldn’t be the only time one enormously red-hot comic’s sales affected the sales of yet another allegedly-hot funnybook released at the same time. The first Aliens Vs. Predator comic, which seemed to have a lot of customers anticipating its release, came out at the same time as another “hot” comic (I believe it was Todd McFarlane’s Spider-Man #1) and it just sat there, warming the shelf, looking at me with its sad, puppy-dog eyes, asking “why doesn’t anybody wwwove me?” Of course, I seem to remember that green logo on an orange background cover not standing out at all on the comics rack. Honestly, I don’t know why that would be…why buying one “hot” comic would preclude buying another. I think in the two cases above it may be just due to the huge amount of real-world press one book got, over the limited fan-press coverage the other received…but who knows. Commenters suggested some other books that may have contributed to the comics market crash…one in particular is Deathmate , which I’m surprised I forgot about. Well, maybe I was just trying to forget about it, since, yeah, it was another one of those books that seemed like it was going to sell like gangbusters, and ended up becoming bargain box fodder. 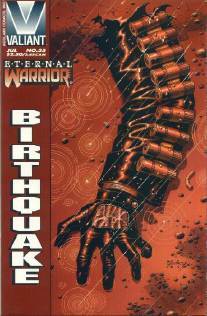 It was a limited series, with the issues indicated by cover color rather than issue number, teaming up the Valiant Comics universe with the Image Comics universe. 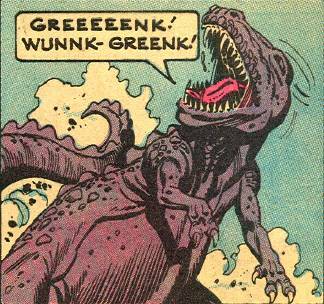 The two hottest comic companies, teaming up for a mini-series? How could this not sell well? Well, first, people were disappointed that McFarlane’s Spawn wasn’t involved, Second, as noted in the Comics.org link, the Image-produced half of the series was enormously late (I believe that Rob Liefeld’s Deathmate Red was the most infamously delayed), killing any momentum the series may have had. Third, it wasn’t any damned good, though I realize that’s hardly a detriment to many a popular comic book series. For a very brief period of time, back when people still cared about Image’s Gen 13, people were looking for their appearance in Deathmate Black , but that demand dried up right quick. Another popular choice was X-Men #1, which had five different covers, the first four forming one large image, and the fifth cover combining all four of the previous covers. The variants were released one a week for five weeks…it did sell enormously well, but many retailers ordered far too many, and it remains one of the most common comics of recent memory. If I remember correctly, we actually ordered pretty well on these and didn’t get stuck with too many left over. Commenter Jim notes that Pitt #1 was a contender. I know that some stores had far too many of this particular issue, but we actually did okay with it…we ordered a case of the things, and they blew out the door. Lots of multiple copy sales as well, though (and I think some of you are beginning to recognize that this is a common story from this period) investors started to see that a lot of the new comics they were buying were in no small supply, and thus had no “collectible” value. Commenter Michael brings up the Spider-Man Clone Saga, which I always saw as mostly a Spider-Man killer rather than a comics market killer, though driving people away from the Spider-Man books surely wasn’t good for the health of the industry as a whole (or, at least, for Marvel). As generally reviled as the Clone Saga was, what people tend to forget is that at first, the clone storyline sold enormously well. It was just when Marvel took a storyline that should have lasted six months, tops, and stretched it out for a couple years that the damage was done. And that damage stuck, crippling the Spider-books until Marvel finally shored up sales with the “stunt-casting” of J. Michael Straczynski as the Amazing Spider-Man writer. There’s some small bit of irony in the fact that today’s kids are fascinated with the Clone Saga issues, and snap ’em up like crazy. They also like the 300 different series starring Venom. Go figure. Commenter Thorpe mentions Triumphant Comics, which I was actually talking to Kid Chris about on Sunday (though I think I kept referring to them as Chromium Comics, for some reason…they might as well have been). Each comic individually serial-numbered…as Mad Magazine used to say on their serial-numbered mags, “collect them all, kids!” I haven’t actually cracked open a cover on one of these things in years, but I seem to recall that they were uniformly terrible, and that they didn’t sell at all on the racks. 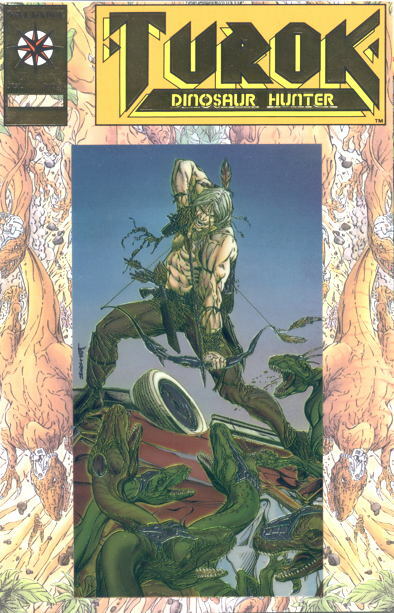 You know, the earlier Valiant superhero comics were actually pretty good…the first ten issues of Solar still hold up, and Barry Windsor-Smith’s run on Archer & Armstong is quirky fun. And, as far as company-wide crossovers go, Unity was fairly entertaining. You can read more about this company at the mindbogglingly-comprehensive Valiant Comics site.